Two TVs, one with Sky Freesat and the other plays DVDs, CD player. Duvets, pillows, extra blankets, bed linen, towels, bath mats, hairdryer. Vacuum cleaner, basic cleaning supplies including washing up liquid, dishwasher tablets, all purpose cleaner etc. Original open fire in sitting room and storage/convector heaters throughout. 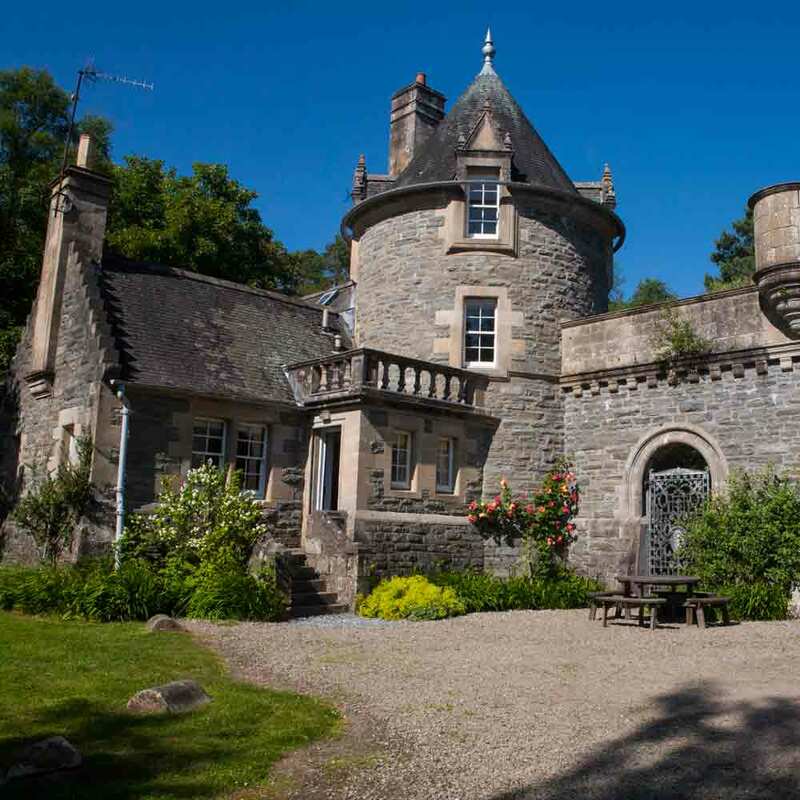 Take a self-catering holiday in your own romantic castle built in the 1890s! This listed building was built by the present owner's great-grandfather as the gate lodge of the east drive to Dunalastair House in 1892, although the drive is no longer in use so no passing traffic. The sitting room of this holiday home is light and airy with three windows, the main one facing the river. It has sofas and easy chairs and attractive original fireplace with open fire. The kitchen/dining room has dining table and chairs and is very well equipped. 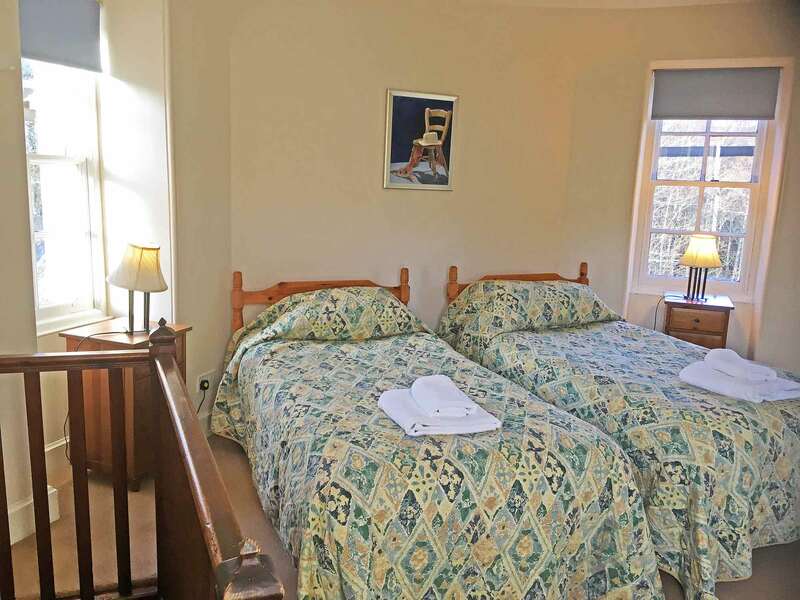 The ground floor twin bedroom has two single beds and it has three windows facing the pine woods. There is a newly renovated wetroom with shower next to it. There is a TV/DVD player together with a sofa in this bedroom. On the first floor there is a twin bedroom with two single beds a dressing table/chest of drawers and hanging space. Next to this is the bathroom with bath with shower over. Up a few steps to the middle tower bedroom with kingsize four-poster bed and chest of drawers and wardrobe and a lovely view to the river and Schiehallion. Leading from the double room, but curtained off, is a steep narrow staircase to the Second Floor twin bedroom. (Please be aware: The stair is unsuitable for the elderly or infirm or for small children). Heating is by storage and convector heaters. Cooking by electricity. All included in the rent. Dogs are welcome and since there are no livestock near the cottage, it is quite suitable for dogs off the lead, however the garden is not fenced. The view across the river to Schiehallion is spectacular. This cottage is ideal for families, or couples who want space and character. 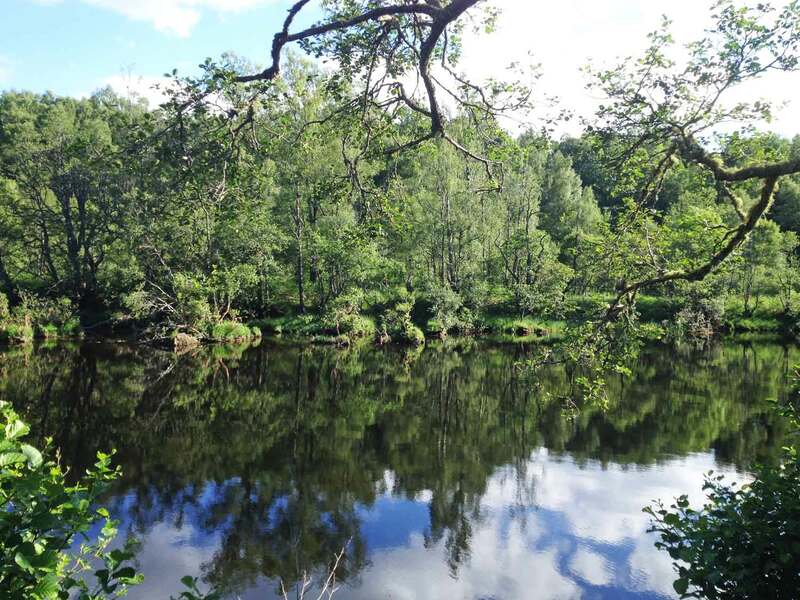 This truly exceptional holiday house is set in woodland beside an peaceful boulder-strewn stretch of the River Tummel, where you can fish. There is a lovely walk from the cottage through the pine woods along the riverside in both directions. To the east a few hundred yards away are some attractive falls amongst the boulders and pine trees. By the house there is a stretch of the river known as the Queen's Pool where you can fish for trout and you can sometimes see salmon. Legend has it that this was where Robert the Bruce ferried his queen across the river. For larger parties of up to 12, there is another cottage, Tuim, close by that could be rented together with East Lodge.